Who doesn’t love karting!? 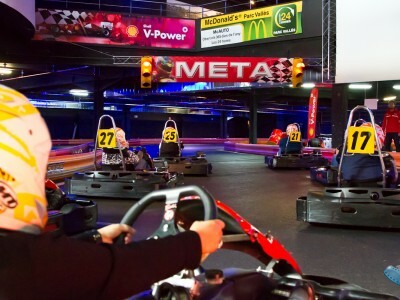 You and the lads can go full Super Mario on your stag do in Barcelona and burn some rubber with a crazy indoor karting session! On arrival you’ll be registered, briefed and kitted out with all the gear that you need. Then it’s all about speed! You and the lads will compete across two time trial sessions, lasting a maximum of 10 minutes each. High octane fun, and the chance to lord it over your mates at the finish line – what’s not to love? Also, the first round is definitely on last place! It is important that you remember to take your passport with you, as it is needed for insurance purposes. Also, you need to be driving with a clear head not only to win, but to be safe – groups can be declined if any member is deemed to be under the influence before a race. If you are hoping for some different race formats, get in touch and we can organise something instead of the time trials for you. If you need transfers for the event, let us know and we can organise this for you too.